Because it’s made in layers, engineered wood flooring has good stability and this means it’s not as prone to shrinking or warping with changes in environmental conditions as much as solid wood is. This stability makes it is possible to use click systems at the joints so it’s ideal for any one looking for a real wood floor they can install themselves. 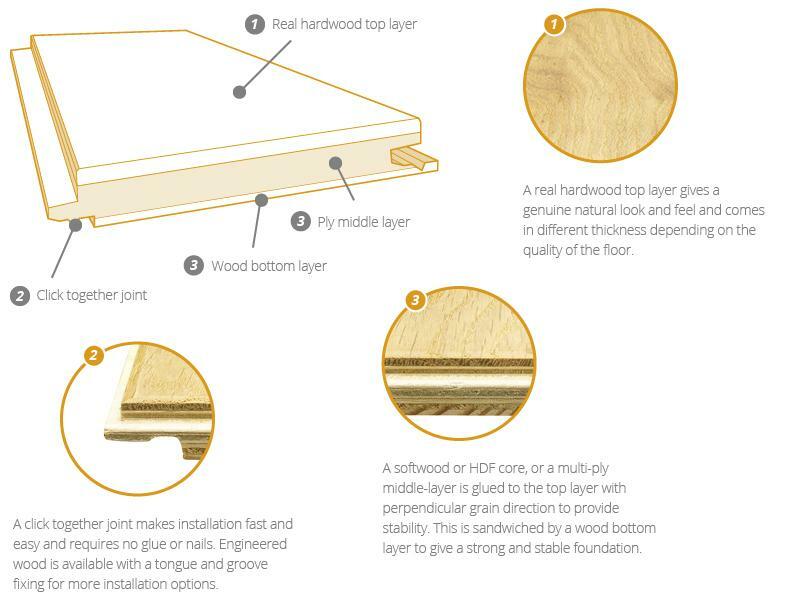 Providing you follow our How to Install Engineered Wood Flooring guide, it really is simple to fit. However, click system floors are only really designed to ‘float’ on top of an existing subfloor. If you are looking to install your floor directly onto joists, then some of our Galleria Professional engineered wood floors come with a traditional tongue and groove joint for this very reason. Engineered wood flooring to be installed in this way must also be at least 18mm thick in order to cope with the extra stress. Engineered wood comes in either a multi-ply or three-ply construction. Multi-ply floors feature a core made up of several layers of plywood for a floor with superior strength and stability and so this construction finds its way on to higher quality flooring. By using a softwood or HDF ‘core’ layer, it is possible to still give strength and stability but at a lower price. As a natural product, engineered wood flooring needs to become used to the conditions of your home before it is installed. This is called the Acclimatisation Period. Even though more stable than solid wood flooring, engineered wood floors will still move slightly, so it is best to let your engineered wood floor ‘settle’ into its new environment before you install it. We recommended a minimum of seven days between receiving your floor and installing it. You can find out more about why it’s important to acclimatise your floor in our What is Acclimatisation guide. With a machined profile, click systems make it easy to join each board to the next. Each ‘male’ joint is angled into the ‘female’ joint of the opposing board (fig: 1). Downward pressure is applied to lock the boards in place and form a secure and reliable joint (fig: 2). The system makes installation fast and easy and completely removes the need for gluing or screwing the boards together. This makes it a favourite for people looking for an engineered wood floor they can install themselves. The look of engineered wood flooring depends on four main aspects; the species of wood, the grade of the grain, surface finish and the size of the plank. The width and length of the plank are covered in our How to Get Your Style Right guide. Engineered wood flooring uses less hardwood than a solid floor, so if you are looking for more unusual species such as ash, maple, merbau or walnut then you are more likely to find them in an engineered floor. Of course, you’ll also find a great range of oak with many high-quality European grade qualities. The grade of the hardwood layer is not an assessment of quality, but of how your floor will look. While you may have heard of a floor being referred to as ‘rustic’, ‘nature’ or ‘premium’, the exact definition can change dramatically from country of origin. At UK Flooring Direct we grade all of our floors with our own system to ensure a clearer process that makes it easier to choose your floor. You can find out how the grade of engineered wood flooring will affect the look in your home by visiting our Grading pages. The hardwood top layer on an engineered wood floor can be brushed or sanded smooth to change its appearance. A brushed surface finish will raise the texture and markings of the grain, giving the floor a more natural and organic quality. A floor that has been sanded smooth has less tangible texture and is a popular choice in contemporary style interiors. Engineered wood flooring makes a great investment and while most floors from UK Flooring Direct will last for decades if cared for and looked after properly, our Galleria Professional range comes with a 50-year guarantee. The hardwood top layer and finish applied to it is the key in choosing an engineered wood floor that fits in with your lifestyle and your expectations. The overall thickness of the floor has little to do with how it will stand up to well wear or how long it will last, this is the job of the hardwood top layer. Most engineered wood floors can be sanded at least once or twice, giving a long life that is sufficient for most families, but for the very best life, floors with a top layer of 6mm or more can last for a lifetime in most domestic situations. The finish of your engineered wood floor will affect how you live with a floor on a daily basis and how much care you will need to give it to keep it looking its best. Here at UK Flooring Direct, we use two main types of finish, oil and lacquer. If you want an organic look to your floor than oil finishes offer the most natural look. Several layers of oil are applied in the finishing process, absorbing into the wood to give some protection. The oil allows the original texture and feel of the wood to remain though will require periodic intensive maintenance with a top-up oil to prevent the wood drying out. Oil finishes show signs of wear in areas used the most, so develop a wonderful ‘lived in’ feel that is unique to your home. However, they are more susceptible to marks and spills so are not recommended for use in kitchens. Available in either satin or matt looks, several layers of a lacquer are applied to the surface of the hardwood top layer to form a protective ‘barrier’. In a satin finish, lacquered engineered wood floors give a clean and contemporary feel to the home, while matt varieties give a more classic and natural look. Easier to look after than oil finishes, lacquered floors can be used in busy areas such as kitchens and dining rooms as they are more resistant to spills and marks. However, once worn, a lacquer finish will need to be sanded off and reapplied. Our premium lacquers are exceptionally tough, so this will not be for several years in most homes. Find out how to care for your oil or lacquer engineered wood floor in our How to? section. Hard wearing, engineered wood flooring can be used in most areas of the home including dining and living rooms, hallways, kitchens and bedrooms. However, it’s important to remember that it’s still a natural product, so we do not recommend engineered wood flooring in bathrooms or any other high moisture environment where there is a potential for leaks such as utility rooms. If you are choosing your floor for the kitchen or hallway, we recommend a lacquer finish as it is easier to maintain and is better at resisting spills and marks than an oiled floor. If your home has underfloor heating, then engineered wood is also completely safe for use as it is stable enough to withstand direct heat. However, when turning on the underfloor heating for the first time, or after a prolong period of being turned off, increase the temperature gradually over a period of days so that the floor can acclimatise to the change. That should be everything you need to know about engineered wood flooring from UK Flooring Direct, but if you have any more questions then don’t forget our Education Centre is full of useful information. Or you can call one of our Personal Flooring Experts on 02476 012840 who will be able to help you on the way to finding your perfect floor.